Open Europe: "Ciao ciao" to the euro? "Ciao ciao" to the euro? "We must tell Europe with strength that the ECB has to start printing money. The ECB has to change its mission." "Either the ECB becomes the [eurozone's] lender of last resort, or the problem of Europe, or better of Germany in Europe, arises. Germany should leave the euro instead, if it doesn't agree with the ECB acting as the lender of last resort." "I'll tell you the crazy idea that I have in mind: let's start printing euros with our national mint [if the ECB refuses to do so]." "If Europe doesn't pay attention to our demands, we should say 'ciao ciao' and leave the euro." "Leaving the euro wouldn't be the end of the world. Britain is a solid country and has never joined the euro." Il Cavaliere's remarks are literally all over the place, i.e. ECB money printing or the Italian Central Bank should fire up the printing presses with or without Frankfurt's approval. Alternatively, either Germany or Italy itself leaves the euro "which wouldn't be the end of the world." Extraordinary stuff. All empty rhetoric? Most likely. But if there's one thing Berlusconi knows better than many other Italian and European politicians is how to tell people exactly what they want to hear. And remember, Italy will see key national elections in 2013 in which Berlusconi's party is a contender. It's no coincidence that he is now mentioning the possibility of Italy leaving the euro - an idea floated by Italian comedian Beppe Grillo, the rising star of Italian politics, during the campaign for last month's local elections (from which Grillo's Five Star Movement emerged as the big winner). And it's a most interesting development that a senior Italian engages in outright anti-euro rhetoric. A big part of the problems in Europe, politicians telling their voters what they want to hear iso what they need to hear. Leaving the Euro is likely a popular idea both in the South and in the North. And as it is possibly the key issue in elections if you are the only main party for that could deliver many seats. Look at Wilders in Holland, basically on basis of some completely unrealistic and idiotic statements around the EU and the Euro he has the last couple of weeks made a huge jump in the polls. Wilders looks like a sensible guy (although being the ultimate opportunist imho). However he has to remain credible and can do some consessions but only within limits (and everything being in those limits is simply not contributing to a solution). Germany where the Pirates (not even really against Europe) made a big jump as people want simply something else. The present governments didnot do a good job that is clear, but things can get considerably worse if you appoint even bigger jokers. In Germany there is clearly 20-30% room for a populist party more on the right, say the CSU becoming independent of the CDU even when it is Christian ( basically a declining force in European politics). A related problem being that former mainstream politicians are reacting to that and become populists in their own right. Look at Hollande a populist of the worst sort only as a representative of one of the old fashioned mainstream parties. There is as such of course nothing wrong with doing what the people want (it is the basis of democracy), but what is wrong is following policies that can never work. Hollande's spending spree; Leaving the Euro from one day to another: or say demanding that the UK leaves basically overnight the EU. Politicians should point out the negatives of that and not simply go along. Use the basis of the popular demand to come to policies that could work and that are carried by the voters and not simply give in to the primary reactions. 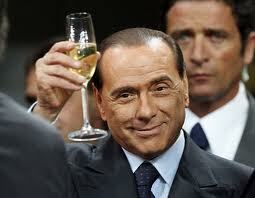 More or less Silvio did a good work for almost 10 years on Italy. Il Cavaliere was a figure into the politics, main reason being his remarks and his strange attitude in some mettings. The role of Italy into the Union is very well fixed, even though the countries debts are huge. Seeing this fact, we start to understand that even if a country has so big external debts, no one is taking measures, or at least strict policy for it..
Italy's "Up yours Delors" moment? A great way to run down a bailout fund? "Yes to Europe means no to debt pooling"
Is the EU really like 27 garden gnomes? Does European solidarity have a new champion? Is Italy next in line? Is a bailout of Spanish banks now imminent? Let's dare to have less Europe!